Galway East Tourism - Turoe Pet Farm in East Galway, West of Ireland.Galway East Tourism - Turoe Pet Farm in East Galway, West of Ireland. The farm offers a range of facilities for both children and adults including: nature trails, feeding of animals, outdoor playgrounds, tree houses, indoor play area, adventure land, bouncing castles, football pitch, picnic area etc. Guided tours available. Since Turoe farm first opened in 1993 it has grown from strength to strength and is now one of the leading visitor attractions in the West of Ireland. This family-run enterprise is situated in a rural setting near a village called Bullaun, 4km from the town of Loughrea, which is on the N6 main Galway/Dublin route. Turoe Farm boasts of many wonderful facilities, all contained on one location. Over the years Turoe Farm has gained a reputation for offering an excellent 'value for money' product and our staff provides first class customer service. The Farm offers a unique facility for family, group and individual outings. Apart from its popularity for school tours Turoe Farm is also an ideal facility for Birthday, First Communion and Confirmation Parties as well as 'Corporate' Parties etc. We are open all year round and are wheelchair friendly. Whatever your needs are, we feel sure that we will be able to accommodate them. 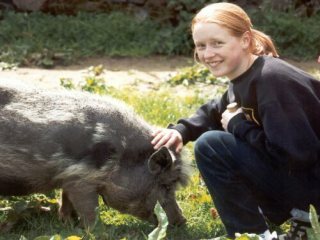 Turoe Farm offers many opportunities for people to enjoy a fun-filled day out. No matter what the weather conditions are, there is always something to do! One can take a leisurely walk around the 14acre park and enjoy the beautiful tranquil setting, fresh country air and the delightful sound of birdsong or go indoors to experience the excitement of children of all ages bouncing their way around the "Inflatable city" - one of Europe's largest bouncing castles. Throughout the year we run a series of special events e.g. Easter, Bank Holidays, Halloween, Christmas etc. If you haven't met the Easter Bunny or Santa Claus in Turoe, there's a treat in store for you! We hope that you have enjoyed this brief introduction to Turoe Pet Farm & Leisure Park.Whenever you decide to visit us, a warm welcome awaits you!